An exceptionally fecund designer and architect, and one of the protagonists of the renewal of Russian architecture during the reign of Catherine II, the Bergamo native Giacomo Quarenghi was often supported, on the building sites of his various works, by architects and Master builders from what is today the Canton of Ticino, who had chosen the land of the Tsars as a destination for their vocational migrations. Whilst he was ambivalent about this troop of Ticino builders, alternating outbursts of sullen mistrust with sincere attestations of esteem, Quarenghi was on the contrary the subject of widespread admiration, fuelled by his fame as an architect and by his talent as a draughtsman. This admiration reverberates in the drawings, some authored directly by Quarenghi, some produced in his workshop, and some copies of his work, which have been preserved in the graphical collections of architects such as Luigi Rusca, Domenico Gilardi, Tomaso e Domenico Adamini, and Domenico Quadri, who were active in Russia either at the same time as, or soon after, Quarenghi himself. 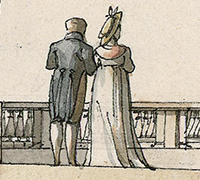 The exhibition, part of an international programme of celebrations for the 200 th anniversary of the architect’s death, collects these drawings in one place for the very first time, some of which as of yet unpublished, and couples them with additional graphical materials which further illustrate the collaboration between Quarenghi and the Ticino architects. Included in this exhibition is one of the rare engravings commissioned by the architect to Giacomo Mercoli from Mugena, held today in Bellinzona, at the Villa dei Cedri Museum.